Gordon Hayward returns to play in Utah for the first time since spurning the franchise 16 months ago and he figures to draw an unfriendly greeting. 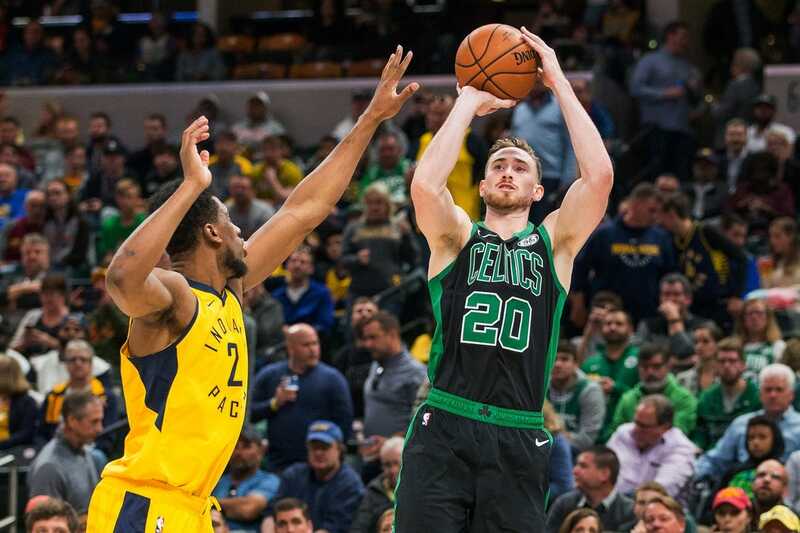 Hayward can expect taunts and jeers from the fans who once adored him when he takes the floor for the Boston Celtics against the Jazz on Friday night in Salt Lake City. Hayward, 28, missed last season's visit after badly breaking his left ankle in his first game with the Celtics. But his decision to leave Utah as a free agent after seven seasons didn't sit well, and this is the fans' first opportunity to express their disappointment. "I kind of knew they were going to be upset," Hayward told Boston-area reporters. "None of it bothered me, except for the people that threw some stuff on fire at our house. That's not acceptable. But other than that, people have a right to be mad." Hayward developed into an All-Star in his seventh and final season with the Jazz. He likely won't be displaying that ability on Friday night. The 6-foot-8 forward is struggling to regain his form after missing the bulk of last season. He is averaging just 9.9 points and has scored in single digits in five of the past seven games. Part of the struggles can be attributed to him being in the process of regaining confidence in the left lower leg. the other part has to do with him finding his fit on a team that features All-Star guard Kyrie Irving as the go-to force and young players Jayson Tatum and Jaylen Brown as key contributors. "It's a transition in a lot of ways," Boston coach Brad Stevens told reporters. "Ultimately, there is a physical transition, there is a limited-minutes transition, there's a playing with a new group and re-integrating into the group. "He's had some really good moments, as has everyone else. We just need to be more consistent amongst our group in having those good moments more and more often." Meanwhile, the Utah players have moved on from Hayward. There was disappointment with his decision to depart in the summer of 2017 but most of it has subsided. "Gordon is a good guy, I think I'm a good guy," center Rudy Gobert told reporters. "Sometimes you make choices that you think are good for you. You don't have to judge anyone. It's just a game, and we're gonna go play basketball." What most helped the Jazz set aside some of the disappointment was the rookie campaign of guard Donovan Mitchell. Mitchell averaged 20.5 points, was runner-up for Rookie of the Year honors and is averaging 22.4 through nine games this season. Mitchell's opportunity to shine was created by Hayward's departure. "With Donovan, it was literally like watching your children grow up in front of you, growing by the day," Utah general manager Dennis Lindsey told ESPN.com. So now the Jazz have a star in Mitchell who is developing into the face of franchise. And the former face remains on the bad-person list as he returns to play in what will be a tense atmosphere. But Hayward insists he has no hard feelings. "It's just circumstances that happened," Hayward said. "With me dealing with everything I had to deal with, and they've had a year to move on ... they had a great year last year. "I've got nothing but respect for the people who are on the Jazz, and what they did for me. But it's not something that I've been thinking about."